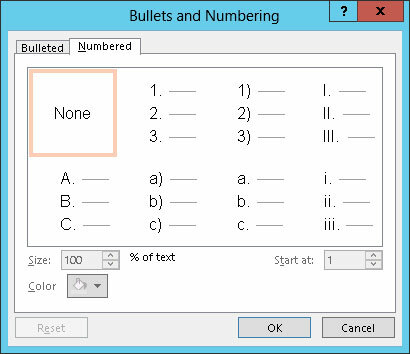 If you want your PowerPoint 2013 slide to include a numbered list, use the Numbering button, which appears next to the Bullets button on the Home tab. When you click the Numbering button, PowerPoint adds simple numbers to the selected paragraphs. If you want to change the numbering format, click the arrow next to the Numbering button to display a list of number style choices. Then you can select the style that suits your fancy. If none of the styles in the list are right, choose Bullets and Numbering to reveal the numbering options shown on the Numbered tab of the Bullets and Numbering dialog box. Normally, the starting number for each list reverts to 1 for each new slide. What if you have a list that has more items than can fit on one slide, such as a David Letterman-style Top Ten list? In that case, you can type the first half of the list on one slide and then type the second half of the list on a second slide. Next, right-click the first item on the second slide and choose Bullets and Numbering from the menu that appears. Then, change the Start At value to the number at which you want the second part of the list to begin. For example, if the first slide has five numbered items, change the Start At value for the first item on the second slide to 6.